Nintendo used to have a strong presence in arcades and even though it has waned considerably in recent years, occasionally we get some sort of Nintendo related product coming along in the coin-op sector. In this past decade a few games have come along, such as Mario Kart GP1 & 2 that was produced with Namco; they also had a Starfox arcade title in the works at one point as well. Recently Capcom has been picking up the Nintendo mantle – they created a Wii-based arcade board for their Tatsunoko Vs. Capcom arcade fighter but we haven’t seen anything else produced for that particular board since. That might have changed with the revelation of a new Capcom/Nintendo joint effort in Japan where Capcom is testing out a “medal” game called New Super Mario Bros. Wii World Coins. Medal games in Japan are gambling devices that give coin payouts and are a popular staple of many arcades there. As we saw in a recent poll, medal games are the second most popular game type in arcades there, falling behind crane machines but pulling considerably ahead of other types of video games. Some medal games integrate video games into them, some don’t but this idea will probably prove popular thanks to the SMB name. From the other images that were taken of the flyer, it appears that the game has been modified beyond just adding a payout feature – the screen is split into four sections and there are a number of betting mini-games that players can choose from. We see from the cabinet design above that it’s very similar to other multiplayer sit-down cabinets you can find throughout various Eastern countries – we saw one at IAAPA a few weeks ago actually (check the Golden Dragon booth). 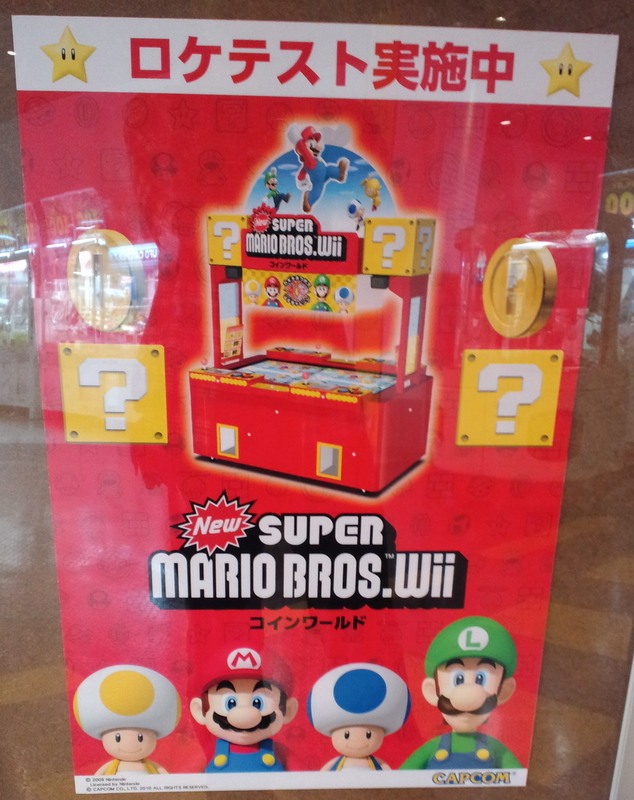 New Super Mario Bros Wii World Coins is currently on location test in Japan, with no release date given for it at present. You can see more pictures from the flyer at the AM-Net Blog.